Covered in multimedia lecture #2032. Few people on either side wanted civil war. However, the issues involved were so important and the differences between the two sides so great that each party felt itself forced into war. Although both sides had support from all classes, one can generalize about where each side got its support. The king's centers of power were in the more agricultural regions of the North and West. His main supporters tended to be the upper nobles, known as peers, from the House of Lords. In the war they were referred to as Cavaliers since they mainly fought as cavalry. Parliament's support came mainly from lower nobles (gentry) and the middle class merchants concentrated in the towns and ports in southeastern England. They were known as Roundheads for their short haircuts, as opposed to the long hair of the Cavaliers. (In fact, many parliamentary leaders, being from the upper classes, kept their hair long.) Both sides also looked outside of England for help. The king hoped for support from the Catholic Irish, while Parliament was allied to the Scots. Since the Roundheads controlled the ports and the navy, the king was virtually cut off from his Irish allies. Meanwhile, the Scots could provide very effective aid to Parliament. Historians used to think that both sides fought poorly in the early stages of the war, since England, being an island, had no standing army and little in the way of a military since the Hundred Years War. However, recent research shows that both sides drew heavily upon veterans from the Thirty Years War and fought more effectively than previously supposed. Despite inferior manpower and resources, the king's forces did have superior cavalry, led by the king's dashing German nephew, Prince Rupert of the Rhine, and could more than hold their own against the Puritans in the early stages of the war. The first battle, Edgehill (1642), was a bloody draw, probably cut short by lack of gunpowder. Both sides came out of this realizing the need for training, discipline, and supplies. Ultimately, Parliament's superior resources and the Puritans' greater willingness to submit to military discipline would be decisive in the war's outcome. It was here that one of the key figures of English history first emerged: Oliver Cromwell. Cromwell was an obscure country gentleman and stern Puritan, typical of many gentry who sided with Parliament. After Edgehill, it was apparent that the Puritans needed better cavalry to face Prince Rupert's wild cavalry charges. Cromwell raised and trained such a regiment, later known as Ironsides for its steadiness in battle. Rather than taking mercenaries drawn from the dregs of society, Cromwell relied mainly on men of a religious nature and committed to the cause instead of looting and plundering. Their first test came in 1644 at Marston Moor. Ironsides held fast against the cavaliers, and the king's forces were crushed. In January 1645, Parliament passed an ordinance to form the New Model Army. Contrary to the myth of the body of "Bible warriors," the New Model Army was made up of draftees and mercenaries fighting for money. However, following Cromwell's example, it was a highly trained and disciplined professional force with regular pay and equipment. In the 1640's and 1650's it would be the most feared army in Europe. Later that year, it met and destroyed the king's last army at Naseby. Charles surrendered to the Scots hoping to turn them against Parliament. However, they turned him over to Parliament. Charles was right in assuming he could split the victors, and the reasons for that split were largely the same reasons that had first led to civil war: money, religion, and government. The civil war, like most wars, had been expensive, and Parliament did not have the money to pay the New Model Army it had raised. It tried to disband the army without pay, promising to repay it later. This did not set too well with the troops, who refused to disband. Instead, they set up a General Council of the Army composed of generals, officers, and "agitators", elected from the rank and file. This council took custody of the king, occupied London, and forced 11 parliamentary leaders out of the House of Commons. Religion was another point of controversy between Parliament and army. Both parties were Puritans, but of somewhat different types. Most of Parliament wanted a state run, or Presbyterian, church. Most of the army, including Cromwell, wanted independent churches with freedom of religion. This was what many of them had fought for, and they were not about to give it up to Parliament. Finally, there was the issue of what sort of government the victors would establish. Parliament and most of the officers, including Cromwell, were property owners who felt that they were most fit to rule since they had so much property to be responsible for. The rank and file in the army, sensing their power, pushed for a much more radical and democratic government. The most radical of these, the Levelers, wanted the vote for all men, a bill of rights, and the abolition of the monarchy and House of Lords. A meeting of the General Council of the Army led to a deadlock between the officers and common troops. Cromwell ended the discussion and ordered the agitators back to their regiments, having one of them shot in order to convince the others to submit. At this point, events forced army and Parliament to reunite, because Charles had escaped and raised the Scots and English royalists in revolt with promises of establishing a Scottish style Presbyterian Church if he regained his throne. This second civil war was a short and decisive affair. Cromwell, armed with the New Model Army, moved to annihilate the Scottish and royalist forces in quick succession. Once this war was over, Cromwell and the army moved just as decisively to resolve the problems in London. First, there was Parliament, which the army especially disliked since some Parliamentary members had entered into negotiations with Charles to restore the monarchy. This led to Pride's Purge, named after a Colonel Pride who used the army to expel some 100 Presbyterian members. This left a "Rump Parliament" of about 60 members who were more agreeable or submissive to the will of Cromwell and the army. Next came the king, who was tried for treason and executed on January 30, 1649. Bishops and the House of Lords were abolished and the religious independents prevailed. However, the democratic reforms that the Levelers and much of the army hoped for never materialized. Resulting mutinies were quickly put down and Leveler demonstrations led to the arrest of their leaders. 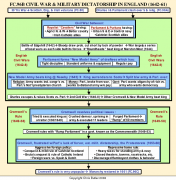 Henceforth, military dictatorship would rule England. At first, Cromwell ruled through the Rump Parliament and a government known as the Commonwealth (1649-53). However, frustrated by what he saw as Parliament's lack of fervor for his type of rule, he established a more blatant dictatorship known as the Protectorate with himself as Lord Protector. Outside of England, Cromwell faced a war with Scotland, which he conquered and ruled with some moderation since the Scots were fellow Protestants. Catholic Ireland, another enemy, was not so lucky. Cromwell's conquest of Ireland was methodical and brutal, leaving wounds that still have not healed today. Like it or not, Scotland and Ireland were incorporated into the greater Commonwealth of Britain, something no English king had been able to do. Cromwell also had an aggressive foreign policy outside of Britain, fighting successful wars against the Dutch and Spanish. England was becoming a military and naval power to be reckoned with. Inside England, people felt Cromwell's heavy hand as well. His wars, standing army of 30,000 men, and navy required taxes three times higher than any which James I and Charles I had ever imposed. Churches were more locally controlled, but people were expected to live good religious lives. Theaters, taverns, and racetracks were all closed down. People dressed in somber colors to reflect the mood of the ruling regime. Life under Cromwell seemed like Calvinist Geneva, except on a much grander scale. Rather than put up with this regime, many cavalier families, such as the Washingtons, Madisons, and Monroes, left England for the American colonies, especially Virginia, much like the Puritans had fled to New England from royal repression thirty years earlier. These two ways of life, the aristocratic nobles in the South and the capitalist Puritans in the North, would take root and clash with one another two centuries later. Thus the American Civil War was largely an extension of the English Revolution. Oliver Cromwell died on September 3, 1658. He was certainly one of the greatest figures in English history, although his motives and the nature of his greatness are still disputed by historians. However, no one of his caliber emerged to take firm control of England after him. His son Richard tried, failed, and resigned. This led to various generals wrangling over power. People in general were tired of the strict Puritan rule. They also longed for a king, since that was the traditional ruler for a country. Finally, a certain General Monk led the army in Scotland to London, restored the Long Parliament, and asked Charles II, Charles I's son who had escaped to France, to come back as the king. England's experiment in government without a king was about to end.